Learning how to make cabinet doors isn't that difficult to do. All you need is some basic carpentry knowledge, the right tools and a small workshop where you can create the new doors for your cabinets. This job, while time consuming, will bring a touch of personalization to your home and help you save a lot of money by doing it yourself. Choosing what type of wood you want to make your cabinet doors is one of your most important decisions. Even though you may want to stain the finished doors a certain color, many varieties are beautiful in their base state, like red oak. Your choices are nearly limitless, with oak, pine, elm, maple and other types of wood perfectly suited for cabinet doors. The key to choosing, however, is making sure you purchase the same type of 1/4-inch plywood as you do 3/4-inch framing wood (for instance, if you buy red oak for the frame, buy red oak plywood for the panels). Choosing pieces of wood with straight grain is also important, as straight grains not only give the cabinet doors a more uniform look, but they also help the door manage seasonal changes like temperature and humidity levels more effectively. Start by "ripping" your hardwood boards with a table saw to a width of two inches. Ripping is a term used to describe the act of cutting a length of wood along the grain. Depending on your desired look for your doors, you can rip the boards to any width really, but for most traditional cabinet doors, it's a two-inch width. These pieces will be making up the stiles (the sides) and the rails (the top and bottom), which make the frame. Take a tape measure and record the dimensions of the cabinet's opening so you can determine how to make cabinet doors that fit properly. For single cabinet doors, add one inch to both the height and the width to allow for a half-inch overlay on all four sides. For double cabinet doors, add an inch to the height and a half-inch to the width. Cut the stiles to the exact height dimensions of the opening, plus the one-inch add-on using the mitre box or saw. Once complete, cut the rails to the proper dimensions. Use a coping bit and coping sled on the router to make cut along the ends of the rails. Use a stick bit to along the edges of the stiles to make a groove for the rails to fit in. Dry fit everything to make sure the frame is evenly cut. Cut the 1/4-inch plywood for your center panel. To make sure it is properly sized for the door frame, measure in 3-1/4 inches from the size of the frame and cut the panel to that dimension. Apply wood glue to the two ends of the bottom rail and insert the rail into the stile grooves. Secure the connection with clamps until it is dry. Insert the panel and secure the top rail to the stiles using wood glue on each joint. Keep it secured using the clamps; keep the clamps in place until the wood glue is completely dry. 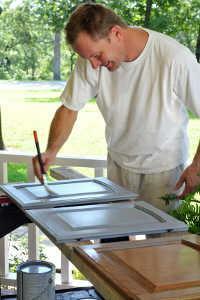 Apply stain, polyurethane gloss or simply paint your cabinet door so it takes on the look you desire for your kitchen. Once the paint or stain is completely dry, add the hardware and install your new cabinet doors to your cabinets.